CloudShare for Eclipse. Click. Select. Plug-in! CloudShare is excited to announce a powerful new plug-in, CloudShare for Eclipse. It provides access to CloudShare environments and features directly from the Eclipse toolbar, enabling hybrid workflows that combine the best of Eclipse with the flexibility and power of the cloud. For example, if you want to test your software while it runs in the cloud, you can check in your code in one window in Eclipse and view the environment through it’s UI in the other. To access the environment, you just click the “CloudShare” drop down menu and select “Web Access”. CloudShare wakes the environment from its ready state and it quickly spins it up in an Eclipse window. You can then flip between windows, instantly checking code against the application’s UI. You can also check on the status of every environment in your CloudShare library, view any of the machines in those environments, and revert to previous versions. Without leaving Eclipse, you can access all your CloudShare resources just like projects or documents: “View Machine” works like “Open” and all of your environments are listed by name in the tool bar. While in your CloudShare environments, you can use all of the other powerful CloudShare features: take snapshots, load data in and out using Cloud Folders, collaborate with team members and share your work instantly with a permalink. For more on CloudShare for Eclipse, check out this video. To access the plug-in within Eclipse, navigate to Help on the toolbar and select “Install New Software”. In the Work with bar, enter: http://resources.cloudshare.com/CSplugins. 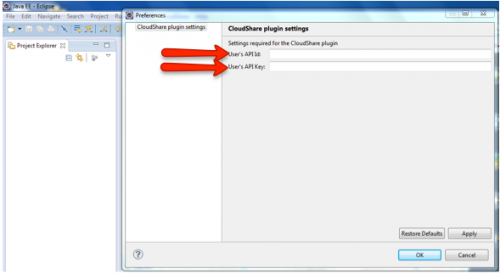 Select CloudShare and you will then have access to the plug-in. The plug-in is installed as a CloudShare dropdown menu on the toolbar. To connect your environments to your plug-in, contact eclipse@cloudshare.com. CloudShare will provide you with your unique API Id and Key. Under the CloudShare dropdown, select preferences. Then Enter your API Id and Key into the window and you are ready to start working in your own hybrid environment.